A bill that would shield certain bed bug data from public records law in an effort to encourage voluntary reporting passed in the House this morning. House Bill 2131, which now heads to the Senate, passed on a 55-1 vote. Rep. Bill Kennemer, R-Oregon City, said that bed bug infestations are a growing health concern in Oregon. “Here’s the bill that you have been itching to vote on,” Kennemer told lawmakers on the House floor. 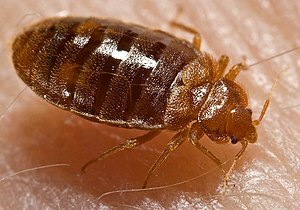 Under the bill, bed bug infestations reported by pest control operators to a public health authority would be kept confidential. The location of the infestation, identity of the property owner and information describing the infestation would be exempt from public records law. Public health officials say that it would encourage voluntary reporting for data that is currently difficult to gather. Pest control operators are not required to report bed bug infestations. If the information was released to the public, it could jeopardize the operator’s business with clients, supporters say. “Collecting this new data allows public health (officials) to make data-driven decisions about prioritization of scarce resources for bed bug education, mitigation and assistance,” Kennemer said. So, to translate: we have a public health concern. It could cause very real shame to those who have an infestation…so, if we keep this information from the public, it will incentivize those in arrears to clean up their act. Nothing — absolutely nothing – supports that assumption. Logic defies it. And yet it emerges over and over in FOI issues: “hide it, and it will get better…” I am itching just thinking about it. of 20,000 pages of so-called perversion files compiled by the Boy Scouts of America on suspected child molesters within the organization for more than 20 years, giving the public its first chance to review the records. The Scouts were ordered to pay the man $18.5 million and the case drew attention to the organization’s efforts to keep child molesters out of its leadership ranks. Media organizations, including The Associated Press, The Oregonian, The New York Times, Oregon Public Broadcasting, KGW-TV, and Courthouse News Service challenged the Scouts’ effort to keep the files under seal, arguing that their introduction by attorneys in the suit makes them public record. Simply send in a suggestion for a dataset you want online, and the state of Oregon reviews it, triages it and then puts it up if it’s public information. So cool! New State Transparency Site Launches in Oregon…very cool! The state of Orego has rolled out a powerful new website that lets citizens easily customize their view of data from state agencies and comment right on the site, the Oregon Department of Administrative Services announced Tuesday. The website, http://data.oregon.gov/, also lets visitors interact with state records, create their own charts, graphs, calendars and maps, and save them online. Visitors may even suggest new “datasets” for displaying information not yet available on the site. Kautz also noted that Oregon is among the first states to employ this new technology. The White House has used the technology since 2009, making available records on visits to the White House and staff salaries. Oregon’s use of the technology is more far-reaching, Kautz said. The site displays information in a wide range of datasets, including state agencies’ expenditures, buildings leased by state government, salaries of state workers, state contracts with private businesses, and more than 60 others. Forty new datasets are already in the testing and evaluation stage. The offerings will continue to grow as viewers suggest more datasets.